I was at the library not too long after an unpleasant time-out session with my boy when this book catches my eye. Time-out is one of the most popular disciplinary techniques used in homes and schools today. This method of discipline is often used as a punishment for misbehavior. 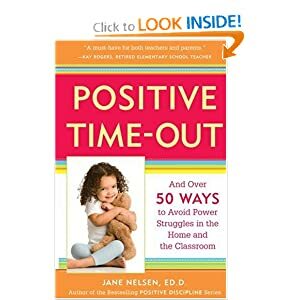 The author Jane Nelsen challenge this attitude and make a case that time-out can be a positive, motivating, experience while punitive time out may seems to work in the short run but does not solve the root of the problem. To Nelson, the objective of discipline is to teach, not to punish. The aim is to teach the art of self-discipline and instill invaluable qualities such as self-confidence and problem-solving skills. To her, treating one’s children with kindness and firmness at the same time is the key. Time-Out is meant to help the child or adult feel better so that both can work together on a solution later if needed. Contrary to the conventional method where the adult dictates the time and place where the child is to stay for misbehavior, the child choose the place for Positive Time-Out and decides how long he or she will stay there. Jane Nelsen stresses that children do better when they feel better and the parent can take one too whenever he/she needs it so that both sides can focus on the solution rather than blame. This book gives 14 attitude tools to help the parent or teacher shift from punishment to non-punitive attitudes and 41 action tools to guide and empower children by involving them in the behavior changing process. In addition, Jane Nelsen talks about the Significant Seven Perceptions and Skills children need to thrive in the world. If every parent would help their children achieve these social and life skills, children would be more confident, cooperative and well-adjusted as adults. I have yet need to put my boy in the naughty corner since applying some of the methods suggested by Nelson. Let’s hope it remains that way.